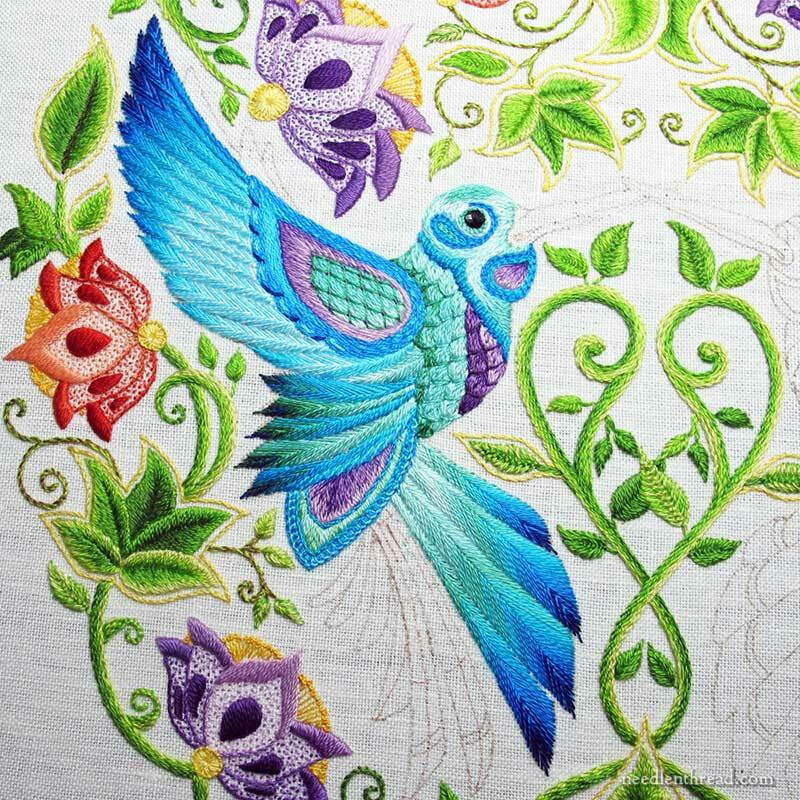 I have nine feathers left to embroider on the hummingbird. Nine?!? That seems like an incredibly high number! I’m beginning to think the feathers are secretly multiplying at night. You can click on the photos for larger versions, if you like. You’ll get a better idea of what was done well…and what wasn’t! I really love, love, love the fishbone stitch for the feathers on this project! I’m glad I went with that stitch. At first, it didn’t quite fit with my plan – I wanted more variety – but I like the results. Which just goes to show you – don’t force yourself into pre-determined absolutes on your embroidery projects. Sometimes, the stitches we imagine we’ll like, we don’t, and the stitches we’re determined not to use end up being the better choice. This project is closer to finished than unfinished at this point (you would hope so – I’ve been working on it for ages!). And as I near the finish line on the one hummingbird, I can’t help looking at the project in retrospect, thinking of how I would do some things differently at this point. Although I don’t plan to go back and change anything at this point, the things I see now that I wish I had done differently are good lessons for other projects. I’ll make note of them in my project book for future reference. Here’s an angle you don’t normally see. I was fetching my camera in the wee hours of the morning, and shot this photo as I walked past the frame. When I look at my embroidery from weird angles, I see things that still need doing. Before I can call the bird complete, I have nine feathers to finish (including the little tips above the wing), the beak, and some touch up stitching to do at the lower edge of the wing and where the body and wing meet. So that’s where I am. Not as far along as I would like, but ever hoping to get there soon, especially because I’ve got other projects going that need my attention and that I want to share with you. Besides, even my mom is nagging me to finish it! Oh, yes, and Happy Halloween! May all your pumpkins smile warmly as the little ghouls coming knocking at your door! If you’d like to follow along with the Secret Garden Embroidery Project, or read about its development from the very beginning, you can find all the articles relating to the project arranged chronologically in the Secret Garden Project Index. I can’t see anything you could do differently, but then I haven’t been staring at it all this time. I just visit your website and enjoy seeing your progress on this piece. It’s beautiful. I hope you found a good framer to do a proper job on this one. My goodness that is gorgeous! So…. when you are all done, you are going to frame it and have a give-away, right Mary?? I think it’s beautiful and can’t see where you would want to change anything on the stitching. I agree I love the Fishbone stitch such an easy stitch and very therapeutic I’ve chosen the stitch for my current Redowrk nativity project. I can’t wait for the finished hummingbird and I’m looking forward to the future projects you are going to share with us which I know will be full of good advice and tips and techniques. Thanks for updating us on the Secret Garden project and I hope you have a great weekend. I had to smile when you said there were things you would change. I don’t believe I have ever finished a piece of work and not seen something I would change if I had it to do over again – even though I make changes along the way. I guess that just means we learn something from every project we do which is a very good thing. By the way, I especially like your humming bird project. The colors are magnificent! Somehow I missed the dark blue stitching that you did on the underside of the scallops on the wing and the light highlights in the scallops. They REALLY make those scallops pop and look 3-D. I would have sworn looking at them from far away that the were cast ons, even though I knew that they weren’t because the shading is so realistic. I love it! Hi Mary, the humming bird is looking magnificent. i was curious about what you would change?? Either way, I think…. I’ll reflect on what I’d do differently towards the end. 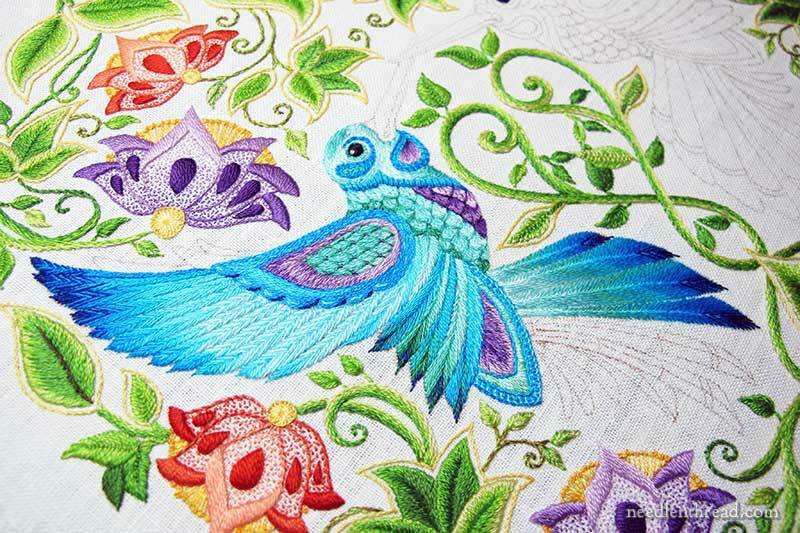 Gosh, I agree, the fishbone stitch looks amazing on those feathers! And the colours and shading are working wonderfully too. It’s going to be a masterpiece, Mary! Previous Previous post: Help Me, Help You!